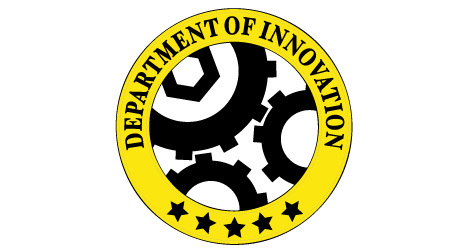 Department of Innovation logo by Jamie Simon. Notice anything about the cogs? They wouldn’t actually be able to turn. Five star innovation. After a slew of comments on the Smithsonian blog, the logo has been updated to show an added gap between cogs (below). The only problem being the smaller cog on the bottom doesn’t have the proper distance between the teeth as related to the larger cog, resulting in teeth sheering off. I think the fact the cogs won’t be able to turn is the least of their worries for this design lol. LOL. Yep, that’s the first thing that struck me, as well. If the Department of Innovation’s job is to solve problems through innovative means the stuck gears could be a good visual representation. However, I think the yellow circle with the text and stars does not work. This could be made into a very good logo if those elements were changed and the gears were punched up a bit. It’s a good start but not quite there as yet. If you look at the lower cog, it’s further away than the other two. Even if the cog to the right wasn’t even there, the other 2 cogs would barely touch. Maybe ★ would be more appropriate…and generous. This is what happens when you let board members loose with MS paint. Given the current rate of child obesity (at least in the US), I’d say the logo perfectly symbolizes how we will live one day: unable to turn. So many people will never know of this mistake but it makes every single designer chuckle. Good good stuff. Many years ago I had a friend whose daughter worked at the Smithsonian. She designed a similar logo as a suggested family shield of arms. The Latin inscription read when translated into English: DO NOT LET THE BASTARDS GRIND YOU DOWN. My friend was a very strong individual who filed a first age discrimination suit in CT against a most blue blood company. Perhaps also a very good and appropo statment of our present condition. Would be more fitting if the client was called ‘Stuck for Ideas’. I’ve got a tummy ache from laughing so hard. That’s pretty poor, of course I have no idea what input the client had but I can’t really find anything positive to say. The idea is pretty cliched the weight of the black line bordering the yellow is unconvincing and the drawing of the cogs shows little skill. Sorry but there it is. Heh I laughed too when I saw this but I believe they already settled it up with the one who made this and the remedy was to put that space between the lower and right cog as seen in the link in this post (click smithsonian) :) still, it doesn’t look as ‘innovative’ as it should be. Just updated the post with the newly-refined logo. One small problem. The new problem isn’t small. It just doesn’t make sense and makes me feel like this thing just isn’t going to work. You should get readers to send in their design suggestions. it’s just clip art. No one would pay for this. As an outsider, I appreciate the design comments. Any 6th-grader would have been able to tell them that the original design was immobile. More than that, gears are so 18th-century. I can’t tell what the logo is supposed to convey. What’s that little hex nut supposed to do? I realize that logos are supposed to be a bit abstract, but those gear teeth simply would not work in any real machine. I suggest one simple improvement: add a thick red diagonal, upper left to lower right. Is it just me or do others find this logo ironic? Innovation means to renew or change but they used cogs to show that. They created a logo which was innovative for the 1800’s. Neither did they renew, nor did they change the imagery of “innovation” leaving it over-used and stale. I feel very underwhelmed looking at this. I can’t believe that no one from the company realised this when they are supposedly five star, it doesn’t reflect well on them and now as stated, the new design still doesn’t work due to the size of the cog teeth. Even with this matter solved, I still feel the logo needs much work to reflect their five star reputation. it’s a perfectly plausible construction, only a 2d picture of a 3d thing. Irreparable. You can’t fix stupid. Will there ever be any one logo to appease everyone ? Not very likely . even (or especially?) in the world of logo design, attention to detail includes making sure that it would work in the real world.